When Phoenix 1.4 was released, the default CSS framework became Milligram as opposed to Bootstrap. In this post we’ll look at how to switch out Milligram for Bootstrap in a Phoenix 1.4 application. We’ll start off by creating a new Phoenix application and then look at how to go about getting Bootstrap installed. And with that we’re ready to tackle installing Bootstrap. So without further ado, let’s get at it! Our first task is to install Sass. To do so we can use npm. We’ll change into the assets directory, and then run the necessary npm commands. Once that is complete we can rename our .css file to .scss. We now need to update app.js to point to the renamed file. And finally we need to update webpack.config.js so that our Sass files get processed. All we’ve done here is alter the test statement to match on both .css and .scss; and then in the use section we’ve added sass-loader. We are now good to go with Sass. Onto Bootstrap! Note that jquery and popper.js are required by Bootstrap, thus we are installing them as well. Now we need to import Bootstrap in app.js. And we can remove phoenix.css as we won’t be using it anymore. This would affect items marked with the primary class. So if we have a button with a class of btn-primary, we’d see. The final step is to import our custom file and the Bootstrap scss file in app.scss. And we’re done! Now we’ll add icon support via Fontawesome. I generally tend to use the Fontawesome CDN and this is the approach we’ll take here as well. This means all we need to do is update our application header to include the CDN link. And that’s it, we’re ready for a test run. Let’s navigate to the root directory and fire up the server. If we navigate to http://localhost:4000/ we’ll see our beautiful home page! Now that we are using Bootstrap we’ll need to use Bootstrap classes to make our HTML look good. 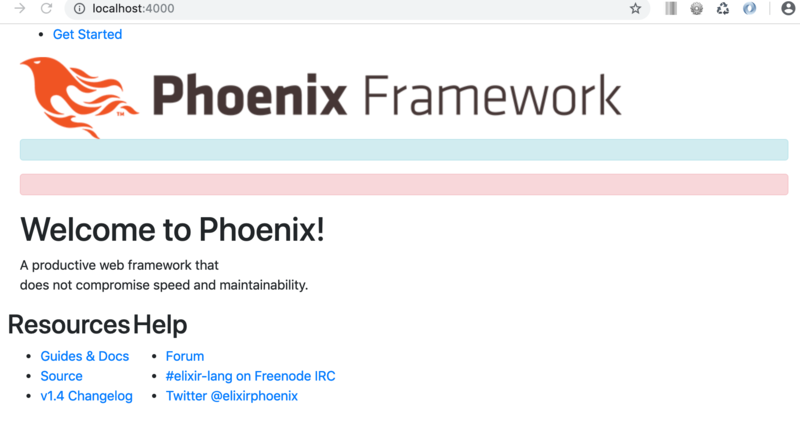 I won’t go over re-styling the default Phoenix homepage, but just to make sure Bootstrap is working let’s throw a navigation bar onto our page. We can see the navigation bar is showing correctly and the dropdown menu is also working, indicating the jQuery Bootstrap components are all good. With that confirmed let’s deal with one problem in the current layout; the alert sections are always appearing, i.e. So we need to wrap these in conditional statements. That pretty much wraps things up, one more item to make note of however is that the default form helpers won’t work very well without some adjustments. It won’t look very good! The error message won’t display great either. The error message fix is easy, we just need to remove the paragraph tag. Oops, something went wrong! Please check the errors below. Fixing the form itself requires a little more effort. One (not very attractive) option is to code the form explicitly instead of using form helpers, i.e. With this option, you’d also need to deal with properly displaying errors on individual fields. So I really would not recommend this approach. The better option is to create some custom form helpers. This is a good post that should help you get started. And if you’re just looking for some code, this is a great GitHubGist that sums things up well. And finally, this post provides some good information around how you can test your custom form helpers. A final option would be to use a package, for instance there is https://github.com/GBH/phoenix_bootstrap_form which looks like it could be promising. My preference in this case would be to write custom form helpers, it’s easy to do and this way you have complete control of what is being rendered. So it’s a bit of effort to get Phoenix working well with Bootstrap, but I think the change to using Milligram as a default makes sense. What with the jQuery dependencies of Bootstrap and the more verbose classes required; the switch to Milligram makes it easier to swap in one’s desired CSS framework. Bootstrap is definitely no longer the obvious option when it comes to CSS frameworks. A number of popular frameworks have sprung up over the years such as Bulma, Foundation, Semantic UI, Materialize, and many others. 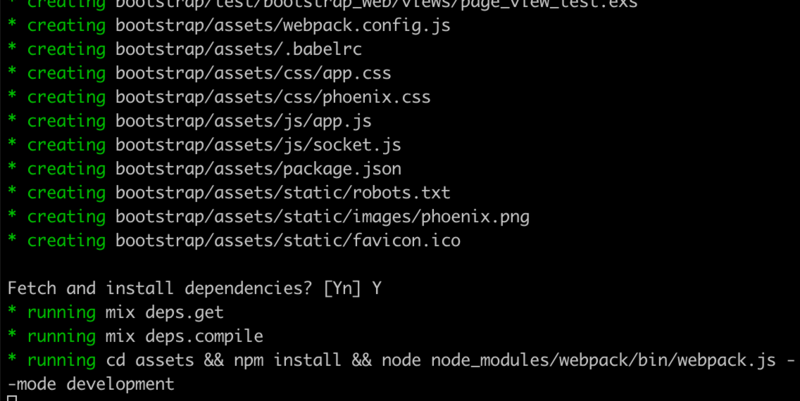 For the most part using these frameworks within Phoenix is going to require similar steps to what we did to get Bootstrap working. You’ll want to look for Webpack and Sass specific installation instructions. Of course using a CDN is also always an option and is a good way to quickly test out a new framework and have a go at it. In anycase, thanks for reading and I hope you enjoyed the post!